Guaranteed Savings… Year In and Year Out! Uncompromising quality, unequaled reliability, and superior service. You already know that these are just some of the ways that MiniCircuits components add value to your assemblies. But did you also know that consecutive, annual purchases from Mini-Circuits add value to your budget, too? It's all part of our commitment to bringing you the best value in the industry. Through our one-of-a-kind Partner Program, you'll have the opportunity to receive pricing discounts based on lifetime purchase volume. Only Mini-Circuits offers discounts based on lifetime purchase volume. With the Partner Program, all of your past purchases add-up to earn a higher base quantity and correspondingly lower prices on the quantity you purchase now (see graph). Our computers are programmed so that each consecutive year you purchase a quantity of a particular Mini-Circuits model (blue bar), those quantities are automatically added-up. 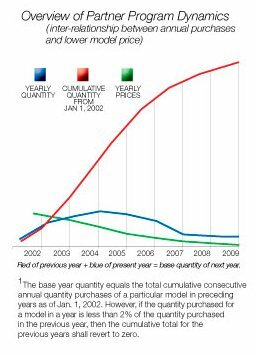 The price you pay today (green bar) is based on the cumulative total of all your previous annual purchases of the particular model plus your current purchase of that model1 (red bar). You can enjoy a lifetime of base quantity discounts on all of our catalog models and many of our custom products. At the end of each year, a statement for all your model base points will be available. The program is available, at no cost or obligation, to qualified customers. Simply make a purchase from Mini-Circuits or any MiniCircuits authorized representative and we'll take care of the rest. Mini-Circuits Partner Program Terms and Conditions. Joining the ProgramQualified customers automatically participate in the Partner Program® by making a purchase of a Mini-Circuits model² from the factory directly. Qualified Customers The program is limited to original users. Companies reselling Mini-Circuits products do not qualify. Original users shall mean approved companies, universities, schools, organizations, a division or subsidiary of a corporation and a department or location of a government agency. For corporations issuing a corporate contract to Mini-Circuits, a division of the corporation may combine quantities purchased by other divisions for cumulative total quantity calculations. In absence of a corporate contract, each division must join the Partner Program® individually. Maintaining Qualification A good credit standing with Mini-Circuits is a criteria to remain a participant of the program. Purchase Location EligibilityPurchases from Mini-Circuits qualify for the program. Product IneligibilityPurchases made for the following do not qualify for the program: special testing, lot testing, serializing, source inspections, and qualification testing. Furthermore, purchases during special promotions or for multi-year or special contracts may not apply. Highly specialized custom designed models may not be included in the program. Please consult with the Partner Program® manager. Purchase Quantities Quantities credited to the program include only the net quantity of each model shipped to the customer in a specific calendar year. Different models may not be combined. Minimum Purchase Quantities The base year quantity equals the total cumulative consecutive annual quantity purchased in preceding years as of January 1, 1990. However, if the quantity purchased for a model in a year is less than 2% of the quantity purchased in the previous year for that model, then the cumulative total for the previous years shall revert to zero...i.e. base year quantity equals zero. Partner Program® ChangesMini-Circuits reserves the right to make changes to the program without prior notice. Partner Program® ValidityThe Partner Program® is void where prohibited by law. 1Subject to the provisions of the Terms & Conditions given herein.2All catalog and many special products are elligible. Back to Partner Program Overview.